The Legend of Angkor was started at the end of 2007. It basically tells the story of Angkor Wat presented in a play like manner. 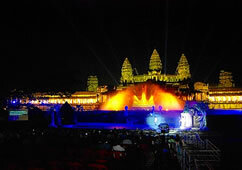 It is done at the East section of the Angkor Wat and what makes this show special is because of the laser lights that they point at Angkor Wat giving the audience a chance to see this temple come alive at night. *from 2009 – 2011, the Management of Legend of Angkor has decided to cancel the show. Should the performance be resumed, we will officially announce it here on our website.